We had absolutely no curtains whenever we moved in. Or curtain hardware. Or bathroom hardware. So, after installing every window with rods, every bathroom with hooks and toilet paper holders... I was tired. I didn't care that the curtains in our living room were too long... but it did annoy me. 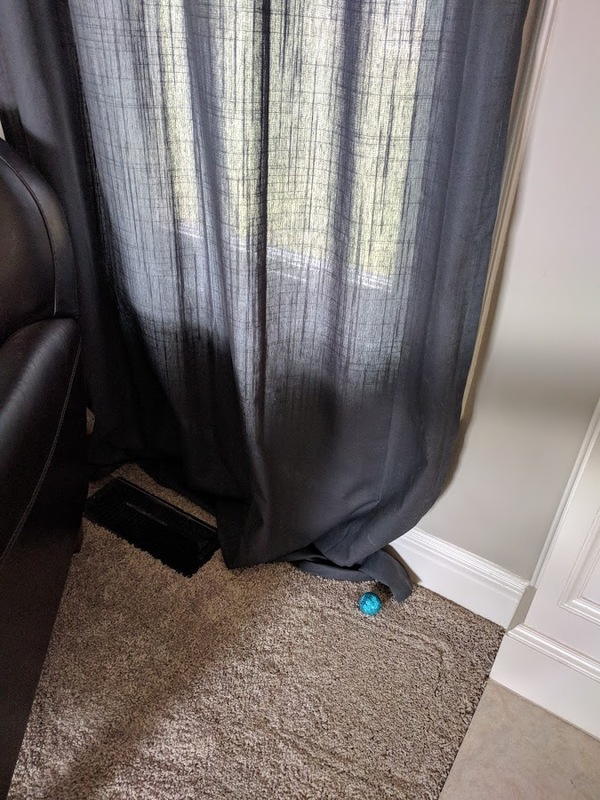 This Christmas, I rearranged furniture to accommodate our rather large tree and came face to face with the wrinkled, cat hair infused mess that was the bottom of my curtains and could stand it no longer. Disclaimer: This is the brand I used and the only brand I've ever used. I am sure there are plenty more out there. They don't pay me to advertise it. Warning: Extremely sticky. 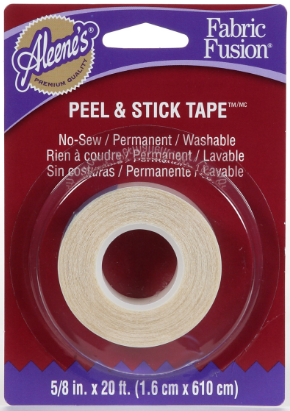 I recommend not using on thin materials as it will stretch out the material if you mess up and need to peel it off to reposition. 1. Measure how much fabric needs to be removed in order to float above the carpet. Mark with a couple pins. 2. Position bottom of curtain on ironing board. No, don't take them down. That's too much work. 3. 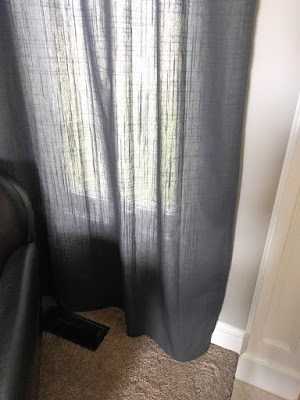 Fold fabric up and then back down (S shape where the bottom of the S is the remainder of the curtain hanging on the wall, and the top of the S is the end of your curtain). You want the top of the S to be the length that you are removing. Keep in mind the width of the tape and add this to the amount. 4. Iron the curtain pressing the seam where you are going to add the tape well. 5. Fold up. You should now have a U shape where the left side is attached to the wall, and the right is the remainder of your curtain including that which you will be removing. 6. 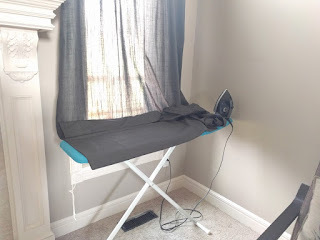 Cut a piece of fabric tape to the width of your curtain and carefully press it under the iron line. 7. Carefully fold your fabric back down. Reach underneath and slowly begin removing the paper backing on the tape. Go slow and press down with your opposite hand to hold the fabric in place as you pull. 8. Check for bumps. Carefully reposition if needed. Press down firmly all along seam. 9. Cut off remaining fabric below taped seam. Done!